The Helvellyn Triathlon run route is tough at the best of times. Add strong winds, low cloud, heavy rain, sleet and patches of lying snow and you’re in for a real challenge. Mark and Scott were booked on to the triathlon in September and were keen to see what the route had in store and Mark wanted some advice and the opportunity to try out some kit. Rain was falling as we left Gillside Farm on the steep, stepped path. 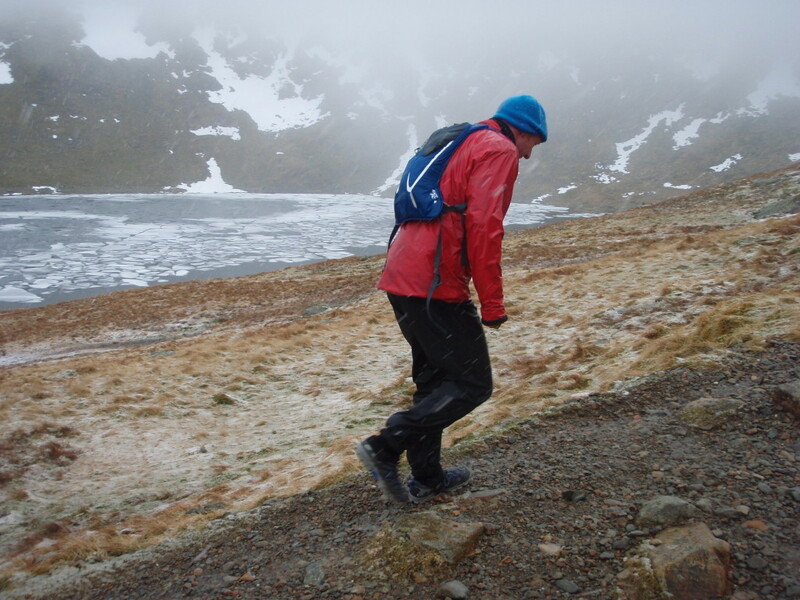 I was already wearing full waterproof cover; Kamleika smock and trousers whilst Mark chose inov8 Mistlite trousers and an old goretex top, saving his Raceshell waterproofs for later. Mark opted to try a rucksack rather than bumbag and used the inov8 Race Pac 4 whilst I used the larger Race Pro 12 to carry some emergency kit. Scott chose the bumbag option with an Osprey Talon although didn’t include water bottles as there was more chance of drowning than dehydrating! 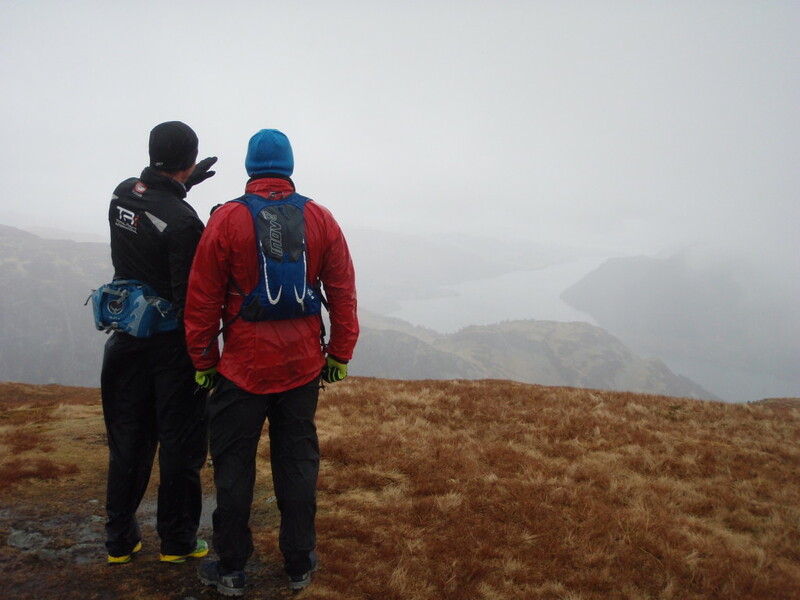 Conditions worsened as we ascended Birkhouse Moor with the wind picking up and the rain turning to sleet and so the stop to admire the view of Ullswater was a brief one. Although it was the last week of April the long winter had get to relinquish its icy hold and Red Tarn still had a covering of ice. The route is firm and rocky underfoot and both Mark and I wore inov8 Roclites; 315 and 285 respectively which performed well both up and down. Scott wore Newton Momentum trail shoes, an American brand I hadn’t come across they brightened up the day! We ascended Swirral Edge into the cloud and thankfully gained some respite, sheltered from the wind although wet snow was now falling. High on the edge a large patch of compacted snow forced a slight detour requiring an exciting bit of hands on rock scrambling. 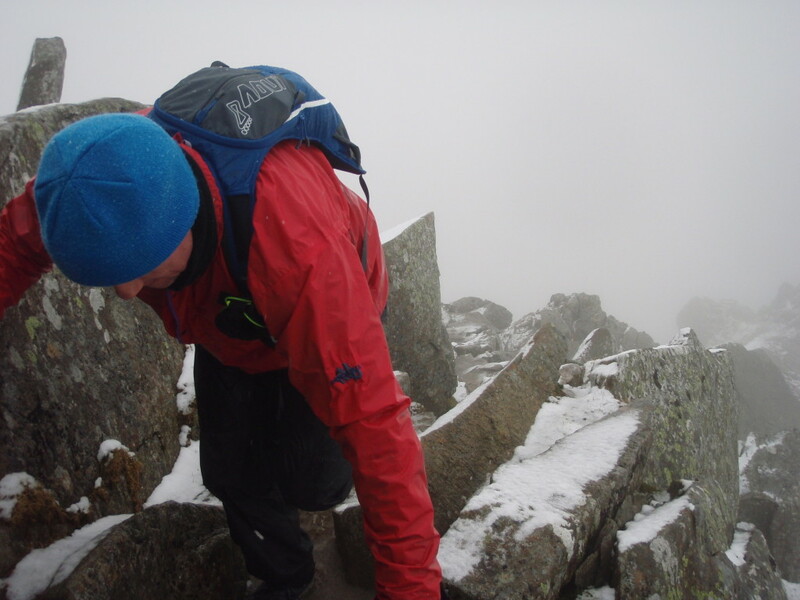 As we emerged onto the summit we left the lee and were met by strong, gusting winds. This was no place to linger so turning Northwest we made haste towards Lower Man. Visibility was around 50 metres and I was conscious not to miss the path to White Side, easily done in these conditions. 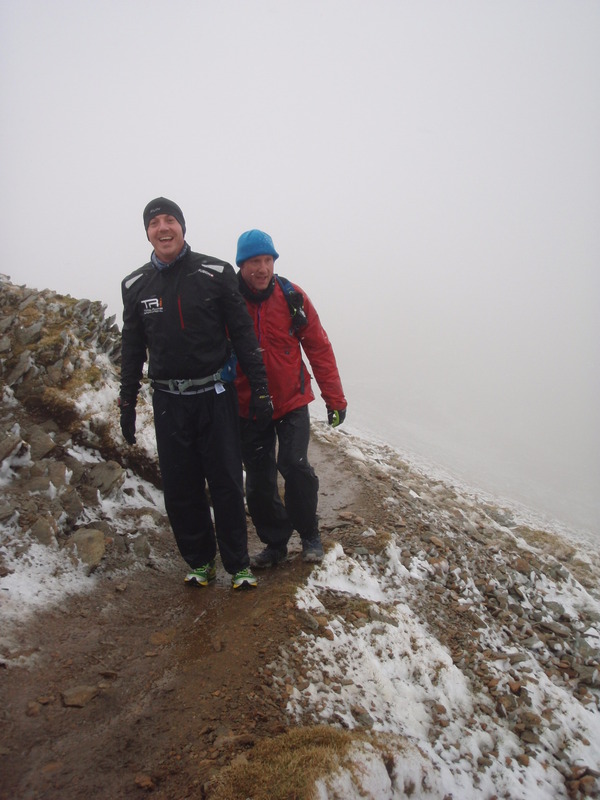 Knowing that there is a “sting in the tail” with the climb of White Side is important for race preparation and Mark and Scott were glad to see it if not glad to have to run up it! Running off White Side we swung East and used the zig zags to practise downhill running; important to try to flow rather than put on the brakes and use up valuable energy – the legs are going to be tired by this point on race day. Dropping to the Youth Hostel the wind eased although the rain continued to fall heavily as we discussed race nutrition; gels, energy bars and sweets and Mark told me his recipe for making Spirulina palatable! Safe now, we scoffed my emergency Jaffa Cakes as we trotted down the track back to the farm. Mark and Scott were happy with the outing, it’s given them a chance to test the kit they need and now know what the route has in store. It was a grotty day but it’s sometimes more rewarding to put yourself through testing conditions and it gives you an idea of how hostile the mountains can be. 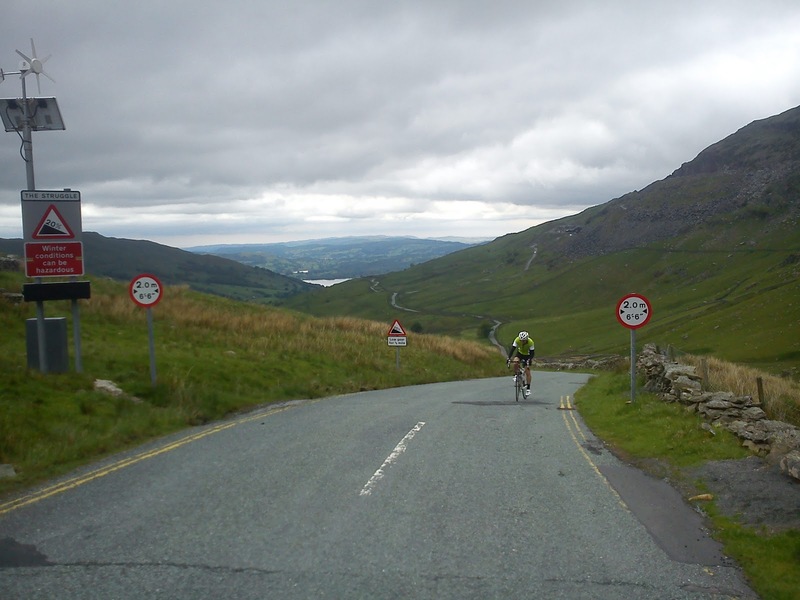 My friend Matt has entered the Helvellyn Triathlon, due to take place at the start of September and he asked if I would go round the course with him as part of his training. It’s always good to know what to expect on a race and if you haven’t done it before the best way is to go round it at an easy pace, making a mental picture of the terrain – where to take it easy, where to push on and to know where the main difficulties lie. That way you avoid nasty race day surprises such as steep or rough sections. We decided to ride the bike route first, again in order to know the route and to try to replicate some of the tiredness that you are bound to experience whilst running up Helvellyn after having (hopefully!) ridden up the “Struggle”. We decided on a midweek date to avoid the crowds, camping at Gillside campsite which is right on the run route. We set off at an easy pace on the bikes, enjoying the scenery of the quiet roads to Troutbeck before the rude awakening of traffic on the A66. Here it was best to blast along the 5 miles or so to Threlkeld to minimise our time in the close proximity to the traffic thundering past. It was a relief to turn off towards St John’s in the Vale and back to tranquility, passing farmland and slowing down to soak up the view. Soon we came back onto the main road, although not so busy this time, and enjoyed a gradual, undulating downhill past Thirlmere and Grasmere and on into Ambleside. We were under no illusion of what was to come and had fuelled up, taking energy gels and drink in preparation for the struggle to come. There is no gentle lead in to the climb, as soon as you turn off the main road in Ambleside it hits you and for the next couple of miles we were working close to maximum until the road flattened to give a brief respite to gather our breaths before the final steep pull up to Kirkstone Inn. Thankfully it was downhill all the way now, a lovely high speed descent losing all that height, straightening out the bends and hoping the sheep wouldn’t walk into the road! Then a steady spin through Patterdale and back to the start. Back on the campsite out transition was a leisurely one, refuelling and changing over a cuppa! Then the run, again straight into a steep climb up the track from the campsite and onto the fell taking the well maintained path beside Mire’s Beck. Arriving at the wall we stopped to check the map to make sure we didn’t miss the turn off to Birkhouse Moor then pushed on to the summit achieving 500 metres of ascent in less than 2 kilometres. The next section to Red Tarn was a straightforward flat run before hitting the climb up Swirral Edge to the summit. 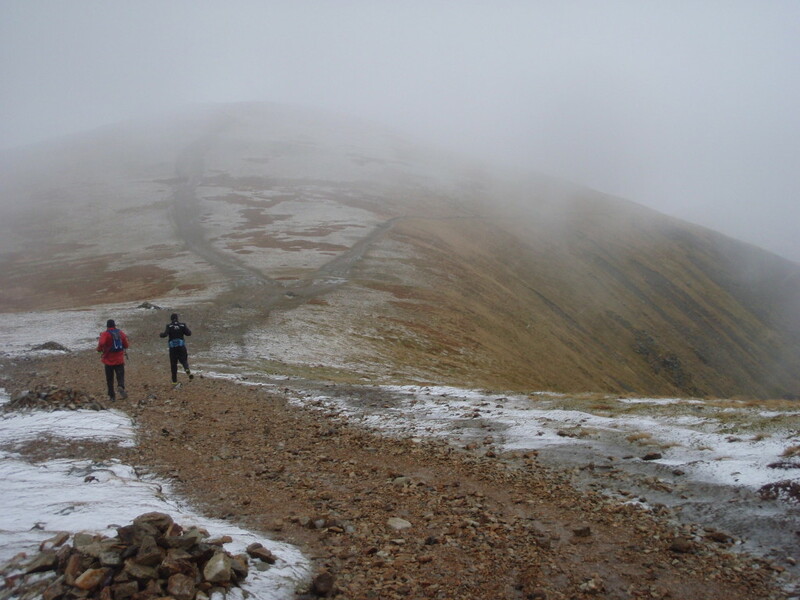 We could see Helvellyn now and the path disappearing into the cloud at the steep rocky section of the climb. We passed Red Tarn and the final climb began, the well made path gradually deteriorating as we got higher and the cloud enveloped us. Visibility soon dropped, as did the temperature, a sound reminder that the mountains are serious places and shouldn’t be underestimated. Eventually we were at the top, the climb ending abruptly and although the race route doesn’t visit the actual summit cairn we decided on a brief detour just to “bag” it. Then it was back onto the race route, checking the map and compass as visibility was poor and it would have been easy to miss the junction to Whiteside Bank. Psychologically we felt we had done the hard work as we had reached the summit but in fact we had another short effort to regain height before beginning the long downhill. After the hard work of the uphill and due to the wind picking up we both felt cold and stopped to put on jackets. The next section actually felt harder than the climb, the steep descent down the zig zags to the valley taking its toll on weary legs and we were both careful, wary of taking a trip. We soon reached the good track leading down to the Youth Hostel and the home straight on to Greenside and the finish at Glenridding. All in all a good hard day out, and from Matt’s point of view very worthwhile – he now knows where he’s going and where the hard bits are – err, that’s most of it isn’t it?